July 7, 2015 bcalvanocoachingLeave a Comment on Weekly Angel Oracle Card Reading for July 6th through the 12th. Weekly Angel Oracle Card Reading for July 6th through the 12th. This week I was guided to use the Angel Heart Sigils Oracle cards by Stewart Pearce. These are mystical symbols from the Angels of Atlantis. this Saturday July 11th at 1pm EST. The call in number is 424-675-6837 for a reading! To deepen your connection to this week’s reading and messages focus on the round orb or heart connection of the specific archangel and also the corresponding geometric or sacred symbol depicted. Breathe in the beauty and focus your intention with the message. Try the chant also to deepen the healing connection! For the early part of the week we have a message from Archangel Raziel, “Eternity”. Raziel is the holder of the divine mysteries of life. In our ordinary day to day living we often forget that we are a magnificent child of the Universe, a part of an unlimited cosmos and consciousness. The painting by Michelangelo on the card showing God touching the finger of Man reminds us that we are touched, made and infused by the heavens. The Ouroborus or infinity sign reminds us that any given moment we can tap into this divine connection. There is so much more going on than meets the eye and ego. By focusing on our breath we can be brought back to this stillness and vastness. This is the answer to many of your questions as to what’s missing in your life for happiness and healing. Take a moment and focus on the capacity of this revelation. By taking the time to meditate and be still you can tap into this at any moment. Raziel can assist you in finding your inner stillness and connection to the infinite source. 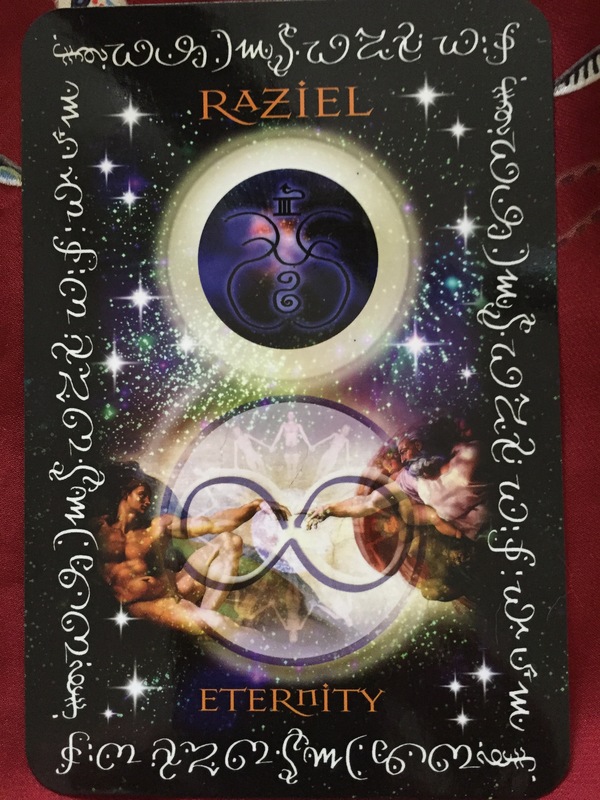 Instead of being in your ego and limited perception of your life, Raziel supports you in connecting to your heart and your remembering who you really are! Chant Hi through the Throat Chakra – the Visuddha (which is considered in a number of esoteric traditions as the entry and leaving point of the soul). Gaze upon the symbol and feel that Raziel’s heart is as your own. 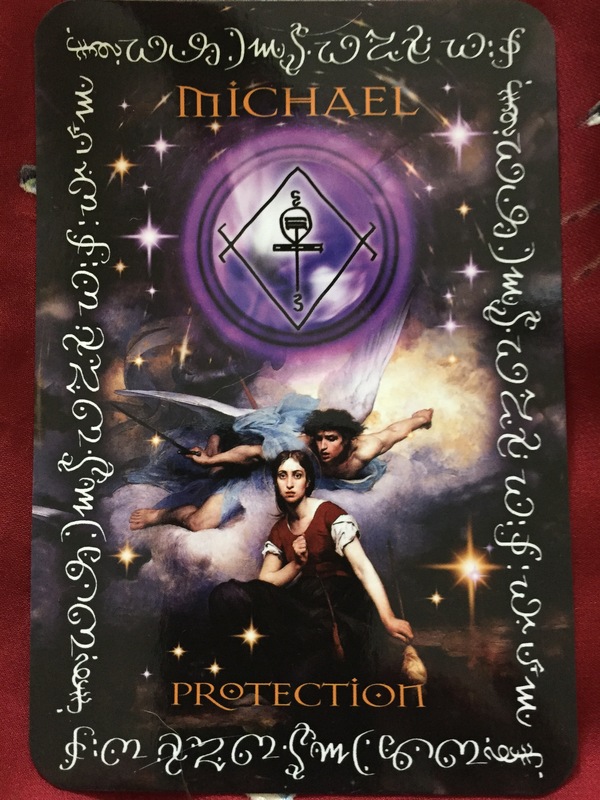 For the middle of the week we have a message from Archangel Michael, “Protection”. Often we may wonder if it is really safe to step out and be your authentic self? Archangel Michael reminds you that you are divinely protected. As we open our heart on our spiritual path we can often feel very vulnerable in this world today. With the ever changing times, lower energies and stresses one can easily shut down. Archangel Michael acknowledges our commitment and passion to make a difference in the world with our life purpose. Michael wants you to know that you are divinely protected as you open your heart to your desires and passions. Here we see Joan of Arc on the card, someone who answered the call of her life purpose. It is safe to be you in all your capacities, especially with your new found psychic abilities and heightened intuition. Chant Hee to awaken the life force through your Sahasrara – or Crown Chakra as you gaze on the symbol and feel that Michael’s courageous heart is yours. 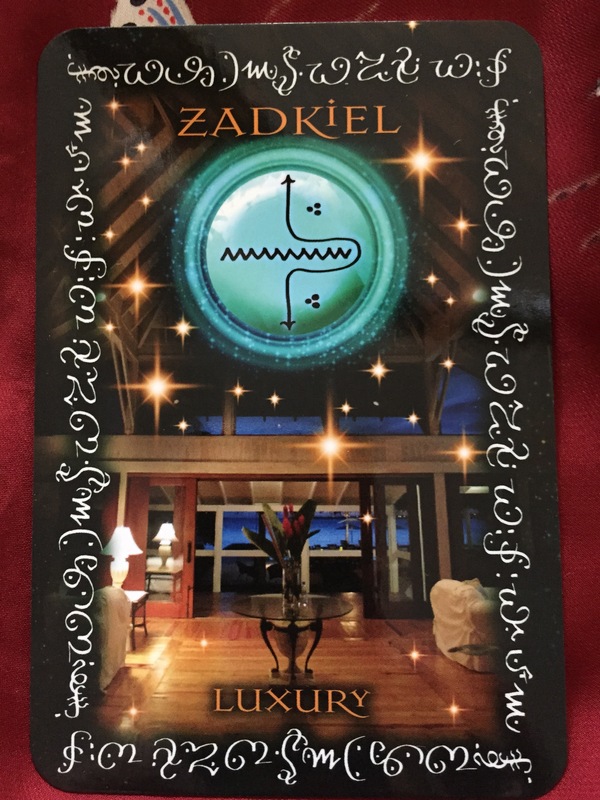 For the end of the week we have a message from Archangel Zadkiel, “Luxury”. Many of us find it difficult to totally embrace the idea of luxury, feeling that perhaps we are undeserving or that it is even superfluous. Unknowingly we can then commit to a life of scarcity and limited means of support. Archangel Zadkiel supports us in allowing infinite luxury and abundance into our lives. Take the time to visualize daily the fullest visions of beauty, abundance and joy coming to you flowing freely. Remember that you are a child of the Universe looked after by Source. Chant Haw through the Base chakra to ground and earth your physical body at your Muladhara. This week with the Angels Heart Sigils Oracle Cards by Stewart Pearce we are supported by Archangels Raziel, Michael and Zadkiel. Claim your divine connection to the infinite cosmic wisdom available to you. You are divinely protected as you fulfill your life purpose. You are totally deserving of freely flowing infinite abundance and joy. These loving angelic heart connections are gifted to us this week to heal and support us on our daily path. In-joy! Bcalvanocoaching offers special programs of ongoing coaching sessions. Spiritual intuitive guidance, angel messages, energy clearing and life coaching all to create the results in all areas of your life. I also provide group angel readings at parties and events. 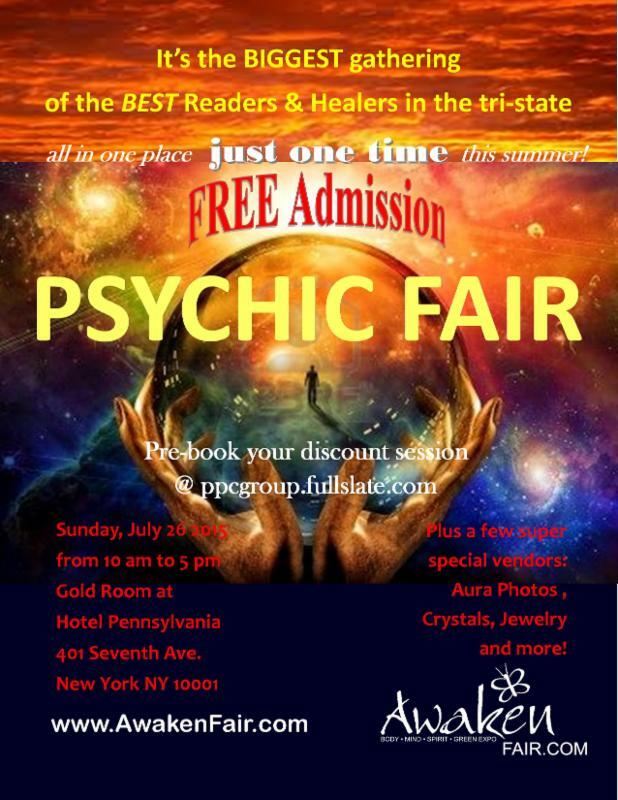 July 26th Psychic Fair NYC, Hotel Pennsylvania, NY- I am giving 15 and 30 minute readings. http://www.AwakenFair.com 1 0AM to 5PM If you pre-book you receive a $5 discount! 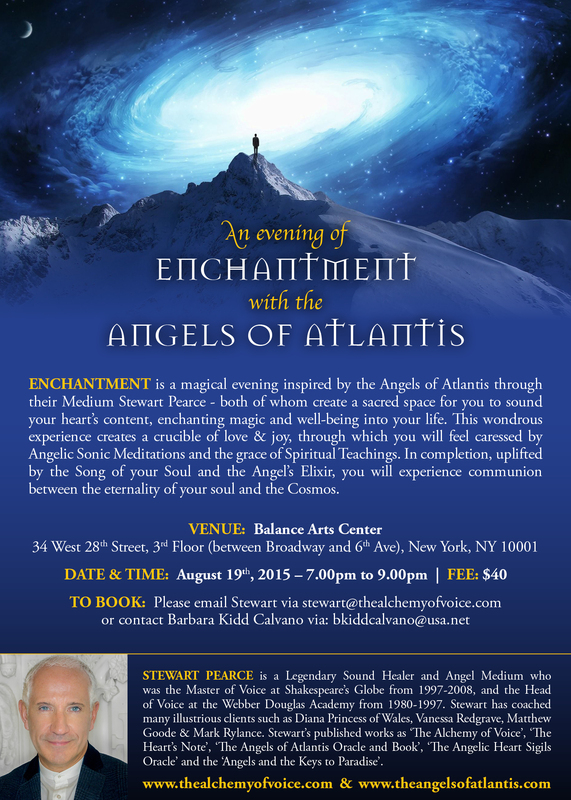 ENCHANTMENT is a magical evening inspired by the Angels of Atlantis through their Medium Stewart Pearce – both of whom create a sacred space for you to sound your heart’s content, enchanting magic and well-being into your life. This wondrous experience creates a crucible of love & joy, through which you will feel caressed by Angelic Sonic Meditations and the grace of Spiritual Teachings. In completion, uplifted by the Song of your Soul and the Angel’s Elixir, you will experience an empathic communion between the eternality of your soul and the Cosmos. Previous Weekly Angel Oracle Card Reading for June 29 through July 5. Next Weekly Angel Message for July 13th through 19th.